What temperature is too cold for dogs? Generally people say: “if it is too cold for you, it’s too cold for the dog”. But, just like people, pets’ cold tolerance can vary from pet to pet based on their coat, body fat stores, activity level, and health. Just because your dog does not want to go out doesn’t mean they should stay in. Use your judgment more than the dog’s. If the weather is appropriate (not bitterly cold, not very wet), get the dog outside, even if for a short while. Even if it’s cold for you, it is important for your dog to get some physical activity, even in the winter. When is it too cold to walk your dog? It varies with the pet’s condition, hair coat, activity level, and how long the dog needs to be outside. It makes sense to not just send the unconditioned dog outside to spend hours in the backyard, but instead to go for a walk on a safely plowed walkway. Check your dog’s paws frequently for signs of cold-weather injury or damage, such as cracked paw pads or bleeding. Does a dog need to wear boots to protect against the cold? Usually not. However, dog shoes are not silly! They keep your dog’s feet warm and dry and prevent salt and other ice-melting chemicals from getting on their paws or between their toes. You can find affordable pairs like these online. While dogs can be trained to wear boots, most boot novices will not enjoy the boots and will be distracted. Does a dog need to wear a coat? Sometimes. Fine hair coat, fine skin dogs like Greyhounds and Whippets wear clothing well, and may prefer a coat including neck warmer for temperatures below 32°F (0°C) when walking, and even below 45°F (7°C) if standing still outdoors. Short bursts of high-speed racing in a fenced yard can be coatless. If a normally long coated dog has a recent haircut, a coat may be useful in cold weather. Different breeds have better tolerance to winter weather.For instance, huge Bullmastiffs shouldn’t be out in very hot or very cold weather. 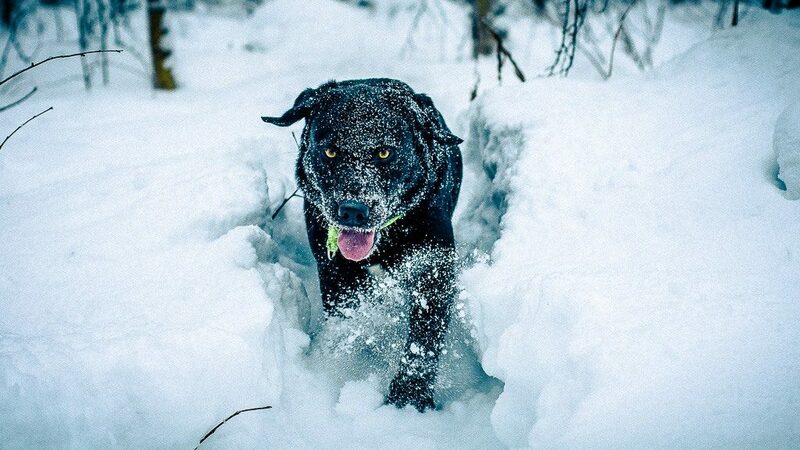 Some dogs were designed to hunt and work outdoors. A Labrador Retriever has a moderate coat with a significant fat layer under the skin to protect for swimming. A Siberian Husky or Alaskan Malamute has a double thick coat and may overheat if extra clothing is added. Competition sledding dogs may wear coats when resting outdoors, but no coat when running. Dogs, unlike horses and people, do not get wet from sweating, so are less likely to chill after stopping exercise. In general, dogs that are double coated (they have an undercoat of fur for the winter) are good in the cold and snow for up to 30 minutes. Many single coat dogs should wear a sweater or jacket. The length of a dog’s coat does not give an indication of how well they can stand the cold. Get more information on your dog’s breed from your vet or look up information about the breed on this website. Age matters! Very young or very old dogs should stay in if the weather is close to or below freezing. Again breed matters. Puppies and older dogs have trouble regulating their body temperature. If the weather is under 40 degrees, consider a dog sweater or jacket and booties. And keep in mind, both are more prone to injuries on slippery surfaces, puppies due to lack of coordination and older dogs due to loss of flexibility. With conditions like arthritis or hip dysplasia, for his comfort, it’s better to keep the dog inside if the temperature falls under 40. Check with your vet about any conditions your dog has. So, what temperature is too cold for dogs? Over 75 degrees Fahrenheit in the sun – Dogs with thick coat may be too hot in the sun, too hot to leave any dog in a car! Between 32 to 70 degrees Fahrenheit – Best dog exercise weather! Below 0°F (-18°C) is too cold for teacup dogs to go out and everybody stays in. Remember, these are general guidelines, so you need to include other factors like, how much wind is there and does the wind chill factor lower the “effective” temperature? Is it snowing and how wet is the snow? It’s fine to walk in the snow, but you should walk a shorter time than you normally would. Moisture on the body, in the form of wet or melting snowflakes, will lower body temperatures faster. The best piece of advice I can give you is to know your dog – pay attention to the signals they are giving you. 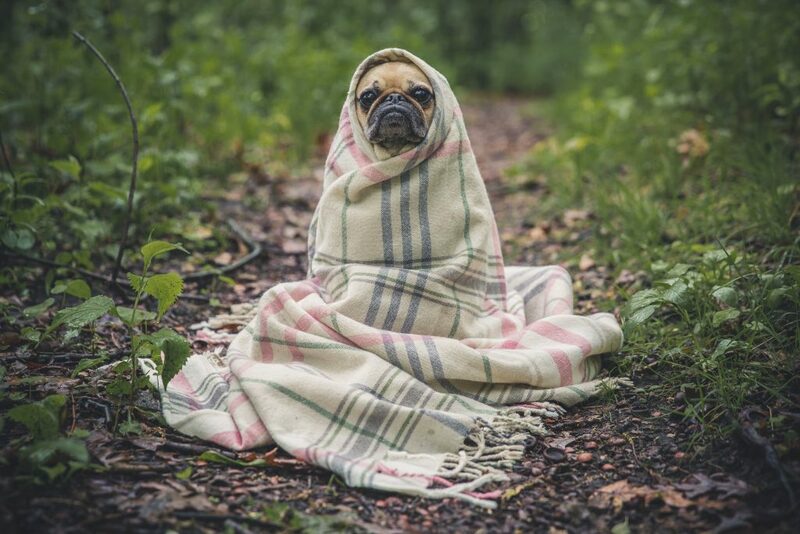 Most dogs, outside with you, will show by shivering or lifting their paw(s) off the ground that they would rather be somewhere else when they are too cold. The dog who is running in circles and sniffing out deer poop or chasing a ball is happy outdoors. The bottom line, don’t hibernate just because it’s cold. Get outside even for a little bit when it is appropriate for your dog’s breed, age, and health condition.